Maisy is a lovable little mouse (well, actually, she's rather large for a mouse) created by Lucy Cousins as a book series that eventually became an animated show. I had never heard of her before, but my wife noticed one of the Maisy videos at the library and thought it might be good for our daughter, Becca, who was two at the time. To say that Becca took to Maisy right away would be an understatement... She instantly loved everything about Maisy and her world, and her sister Evee has followed suit as she's grown up. 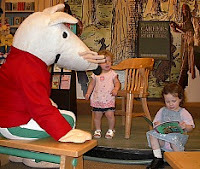 It was a big thrill for them to meet Maisy in person at a bookstore earlier this year. And I've become a fan, too. The content of the shows is clearly directed at young kids, though, so for me, the particular hook that keeps me enjoying the repeated viewings are the highly comical sound effects provided by The Umbilical Brothers (their voicings for Charley the crocodile are hilarious), and in particular the great music. The music for the Maisy videos was produced by Kick Production, which is a group of composers who have made music for several different animated shows including Sitting Ducks and The Koala Brothers. Their Maisy songs remind me of the Blues Brothers joke where Elwood asks the lady at the hick bar what kind of music they play at their establishment, and she answers, "Oh, we got both kinds... country and western." Only instead of country and western, in this case "both kinds" means reggae and ska. I love reggae and ska, and the generally bouncy and happy feel of those styles seems a perfect fit for kids, so it's no wonder this show and its music has been a big hit for our family. The Maisy material includes several original songs as well as reggae/ska treatments of classic kid songs like "If You're Happy and You Know It", "Wheels on the Bus" and "Row Row Row Your Boat". I really love the catchy melodies and grooves of the originals like "Itty Bitty Bug Song", "Poor Poor Panda", "Up Up Down Down", "Walk Along Charley", "Elastic", "It Wouldn't Go", "Maisy Wore a Red Dress" and the theme song. One time when a Maisy video was on, I picked up my guitar and wanted to learn the chords to some of the songs so I could sing them together with my girls. I was amazed to discover that every one of the songs was completely based around I-IV-V chords, and I think they were all in the same key, even. That may have been intentional, to keep the sound simple and consistent for little ears, but it's always cool to realize how much variety can be found within the same simple chord changes, and also within the same particular musical genre. With some bands or singer/songwriters, a very limited sound with similar chord changes on all songs would start to make them all sound the same and I would lose interest pretty quickly, but Kick Production does a really great job giving each of these songs its own spirit and arranging them vibrantly and creatively. In an instant you know when you hear one of the Maisy songs, but you also know each of them distinctively. Unfortunately, the only place I can point you to hear something from Maisy is to one of these preview pages (RealAudio - WMA) for the Best of Nick Jr. compilation CD, which includes a sample from the Maisy theme song. The show is currently on Noggin, so if you have that channel, definitely check it out and listen for the musical interludes. I don't believe they have any plans to release a CD with all of the Maisy songs collected together, but if they did I would certainly buy it in a heartbeat. I LOOOVE the music on these shows. I'd buy a CD in a heartbeat, too. I'm tempted to just make an audio recording from our DVDs, but the problem is that the characters' babbling and giggling is often louder than the actual music. Have you found any other good ska/reggae music for kids?